West-German camera producer Wirgin, based in Wiesbaden, was founded in 1920. 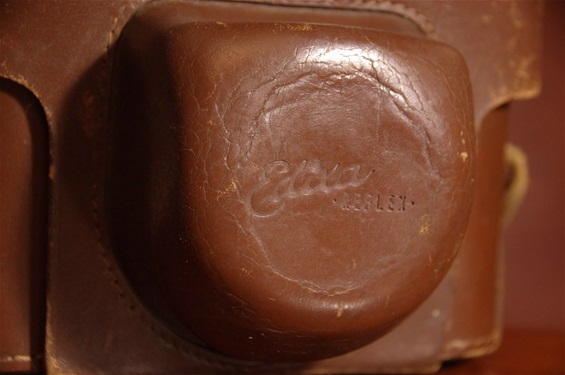 In 1954, they introduced their first PP SLR, the Edixa Reflex. (They had made a waist level slr camera under the name Komet in 1953, but they had to rename it, as others claimed the right to the name.) With the growing interest in this new type of cameras, the Edixa sold well in West Europe. 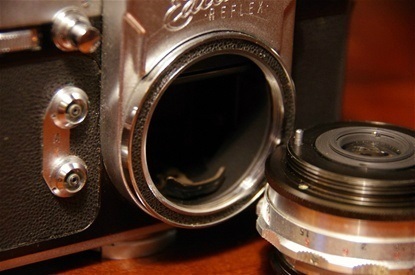 The Edixa Reflex, shown under in model A, featured world's first winder lever to the right, an M42 screw mount, and an interchangeable prism house. 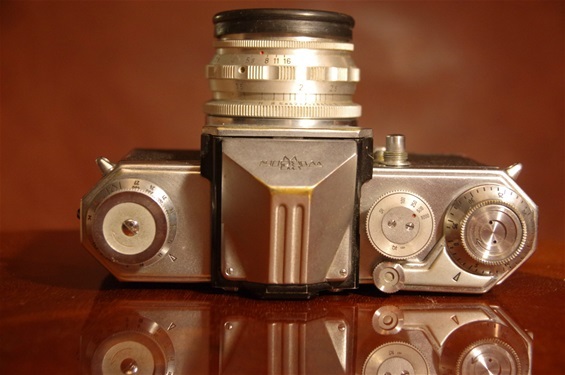 There is also a model B of 1957, featuring a semi-automatic aperture control, before any of the Japanese brands! (But after the East-Germans.) Still, the European brands did not follow the Japanese in the technical development during the 60s, and Edixa met increasing problems until they finally ended production in 1971. But I would say that Edixas PP SLRs were the best of West-German cameras in terms of technical awareness, not following the dead end leaf shutter, for example, and also being first among German cameras to feature the vital Instant Return Mirror. 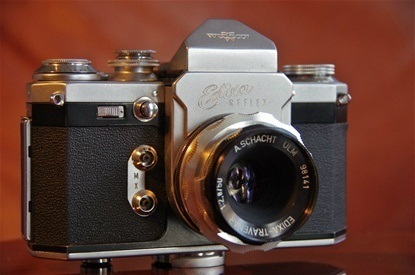 Here is the second West-German PP SLR, the Wirgin Edixa Reflex of 1954. 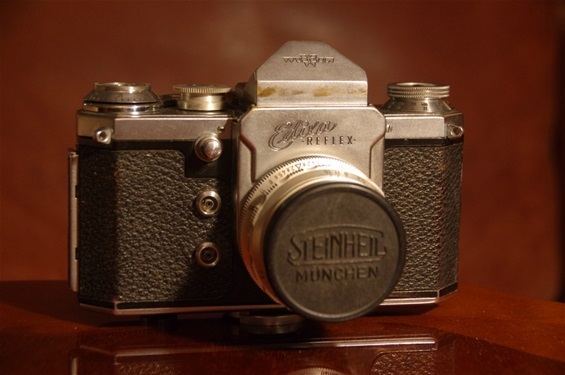 It was a more modern camera than the Zeiss Contaflex, as it was based on a shutter inside the camera, not in the lens, as came to be the normal West-German approach. This copy is a bit worn at the prism house from the leather camera carrying case being very tight. Note the difference to the later models, the two flash shoes not being connected by a bridge, and the form of the shutter time dial. Serial number: 76734. So, here is world's first winder lever to the right. The shutter times were from 1/25 to 1/500. Also note the shutter release button on the front wall, following the East-Germans. This Steinheil Cassar S M 42 lens was following many of the first Edixas. 50/2,8, as was normal at the time. Sn. 1206332. The 50's was a time when one set one's pride into delivering quality. The leather carrying case, for instance, was hand sewn. 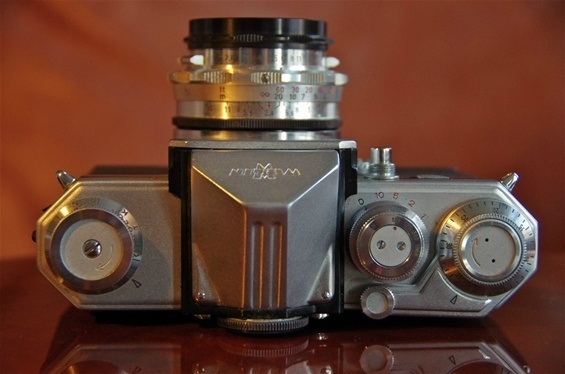 The Edixa Reflex B followed the A-model in 1957. West-German Wirgin Edixa was an advanced camera for its time, and sold in big quantities. It feels like a sturdy camera, but the quality varied, and there are not so many well functioning cameras left. 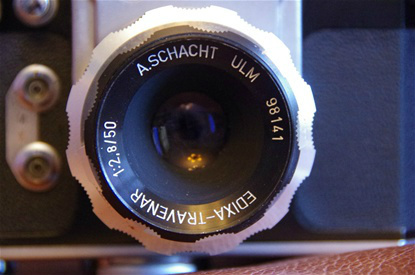 From around 1955, according to some sources, there was a late version with West-Germanys first semi- automatic aperture control. So, the sample shown here might be a late A version. Other sources are more strict about A, B, C and D series, stating that the first semi-automatic came with the model B in late 1956, or early 1957. Until further investigations are done, I will call it a B of 1957. Size: 148x103x52 mm. Weight: 772 g. Sn. 158112. The main difference from the A-model to the B, seen from the top, was the new design of the shutter time dial, incorporating the slower shutter times. This model also has an on/off switch on the front, to the right of the shutter release button. The interchangeable finder continued. 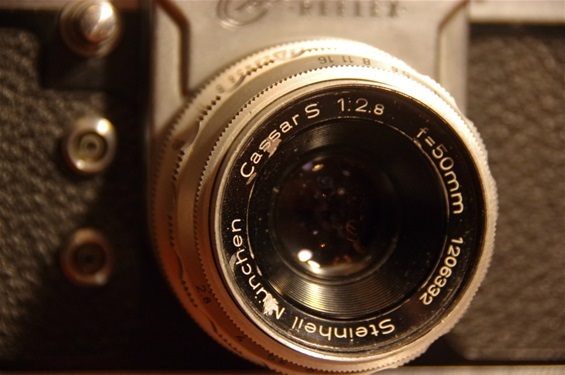 An actuator inside the camera comes forward to hit the movable pin on the lower part of the lens. It came with the B-model. 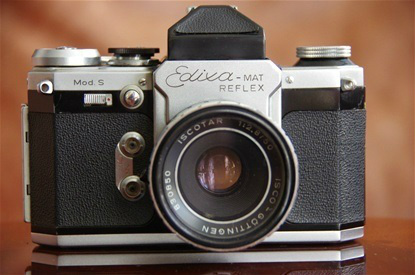 The Edixa-MAT Reflex of 1960 introduced the first IRM to West-German SLR cameras. Sn. 280490.